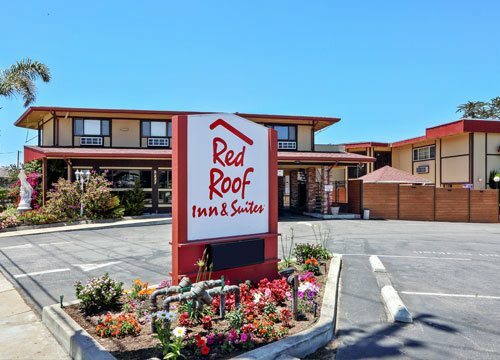 Located on California's beautiful Central Coast, Red Roof Inn Monterey is one of the newest members of the Red Roof Inn franchise. We are conveniently located on Fremont Street near the Highways 1, 68 and 218 near the juncture of Monterey, Seaside, and Del Rey Oaks. Less than 5 minutes away from the Monterey Fairgrounds and the beach, it is easy for our guests to enjoy major events and the California Sun. Drive a little further, and you can visit the famous Monterey Fisherman's Wharf as well as Cannery Row where you can enjoy shopping, fine dining, entertainment, and the Monterey Bay Aquarium. For the adventurous type, only 15 minutes away, you can visit Pebble Beach and the renowned 17-Mile Drive or Carmel-by-The-Sea. Enjoy gourmet restaurants, shopping, and multiple golf courses along the ocean. You can also visit numerous missions and historic monuments around the area. Red Roof Monterey is an ideal place to stay during major seasonal events such as: The Monterey Jazz Festival, US Open Golf, Monterey Auto Week, the Big Sur International Marathon, and the Mazda Raceway Laguna Seca. Red Roof Inn Monterey has 55 newly renovated rooms ranging from Superior King, Delux Queens accommodations to unique 2 King Bed Family Suites with Hot Tub and living area with pull out, Queen Size Couch. All rooms are service-animal friendly and offer your choice 1 King bed, 1 Queen bed or 2 Queen beds or 2 King beds and pull out couch. Our spacious suites consist of 2 King beds, an indoor spa with living area, and two 32" LED TVs. All rooms feature free Wi-Fi, a 32" LED TV, a mini-fridge, a microwave, a coffee maker, a hair dryer, an iron and ironing board. We provide year-round coffee in the lobby. For your convenience, we have an on-site snack machine, soda machine, and ice machine. We also feature a cafe shop conveniently located on our lot. Red Roof Monterey also features a very large parking lot able to accommodate any size vehicle: Buses, Trucks, RVs, and Campers, etc. Our location makes it very easy for our guests to travel through town and reach big event sites such as the Monterey Fairgrounds. We also have an on-site RV Park, which includes hook-ups ranging from electric, 120V line, water, and cable. Common restrooms with shower and a central water septic station for all RV guests. We can accommodate RV sizes ranging anywhere from 10' to 40'. For more information on Weekly rentals without a kitchen, Monthly Kitchenette, RV Park, and rates contact us, and we will be glad to help. Welcome to Red Roof Inn Monterey where you will find our lowest rates. Book Directly on Our Website and Save! 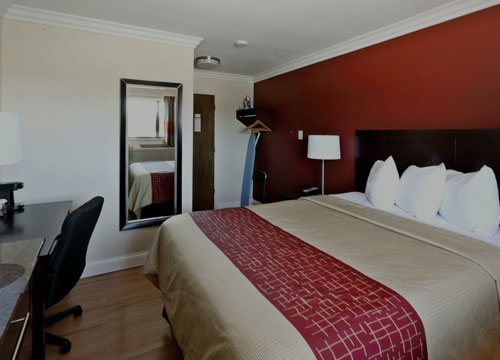 Whether you are visiting Monterey for business or traveling with family, The Red Roof Inn Monterey offers a variety of comfortable and affordable hotel rooms to accommodate your needs. To help make your stay with us more comfortable, each room is furnished with wide selection of amenities including a refrigerator, microwave, coffee/tea maker, alarm clock radio and a 25” television with cable channels. Guests will also enjoy free parking, free wireless internet, and free local phone calls.